Deen Ameerullah is the great grandson of Gool Mohamed Khan. The latter was born in 1853 in a small village of Moorni of the Nasruddin Khel tribe in the District of Dir in Afghanistan. He received his early education in various schools and mosques. At the age of sixteen he passed his examination in Arabic, that is, in Fiqa, Sirf and Naho. On February 14, 1869, at the age of sixteen, he started out on foot from Afghanistan to India since there were no railways or other means of conveyance at the time. He went to India to bring his brother back to Afghanistan as his mother was anxious to see him. His brother was residing in Jaroa State, Rajputana, India. Gool Mohamed completed the journey in 54 days on foot. Gool Mohamed stayed in India for four years. He resided partly with his brother and partly in the service of the Prince. On learning his mother had died, Gool Mohamed Khan returned to Afghanistan alone in 1873. In August 1874, he went to India and joined the British Regiment. While there he learned Urdu, Nagri and Mathematics. He resigned from the regiment and decided to go to British Guiana in search of a better life. He arrived in British Guiana on May 11, 1877. While waiting at the Depot to be drafted to work on the sugar plantation, he was fortuitously recruited to join the Police Force. In his book, “Unity vs Trinity, he recorded his arrival in British Guiana and his accidental recruitment to the Police Force: “I arrived in Guiana on 11th May, 1877 and whilst waiting to be drafted to some batch for the sugar plantation, it happened that the Deputy Inspector General of Police, Mr. Payne, was passing by the Depot, when I saluted him as I took him to be an officer. He drew his horse and put some questions to me in English, which I was unable to answer; an interpreter was called in and I was asked if I would join the Police Force. I readily consented as I had learnt to my cost that the supposed El Dorado existed only in air not even in paper. “I was guided by other European Police officers for six months. Fortunately I was able to pick up a little English as much to enable me to perform my duties. It was just a paradox for an Afghan to learn English in those days. One day whilst I was on duty a gentleman ( who I subsequently leamt was Reverend Darnell, a priest of Christ Church) asked me if I would give him lessons in Nagri. I agreed provided he taught me English in return. The pact was signed and we were both master and pupil during our respective periods”. During this time, Gool Mohamed Khan was not involved in religious activities. As he indicated in his book, “Unity vs Trinity”,… “Unfortunately I had no knowledge of Islamic History” and when asked by Reverend Darnell why he did not attend church, he replied: “I have no interest in church”. 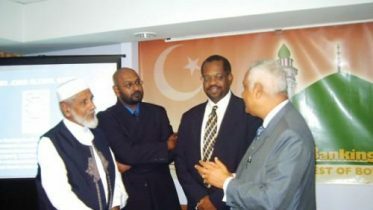 Reverend Darnell gave him a book written by Reverend Founder and Gool Mohamed Khan later revealed “…. the perusal of the book lent by Reverend Darnell had such an impression on me that had I not had a sound belief in Islam I would have changed my religion”. As a result of the criticisms made by the Christian community of the Prophet Mohamed and Islam, Gool Mohamed Khan was motivated to educate himself about the Koran as well as the Bible. Thus, followed the historic debates and discourses with the religious leaders of the Christian Church that resulted in the publication of his book, “Unity v Trinity” . The first edition of the book was published in 1910 in British Guiana. After it was later discovered, his niece, Begum Akhter Jahan Khan, published the Third Edition of the book in August, 1988 in Pakistan. In her publisher’s note, she laudably said “…the book is a veritable illustration of a noble act of propagation of Islam and the Unity of Allah”. Another historical achievement of Gool Mohamed Khan while he was in British Guiana, was his major involvement in the construction of “The Juma Masjid” in Church Street, Georgetown. The mosque still exists even today. In 1947, an article entitled “Do You Know Your Georgetown? 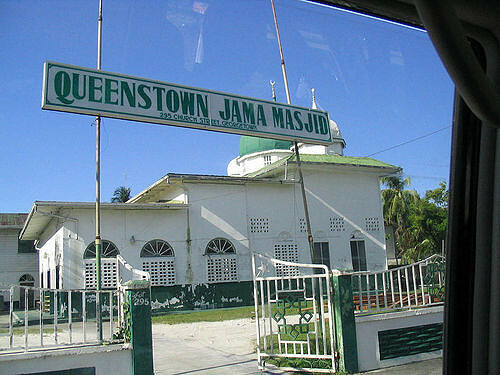 The Juma Masjid, Where Muslims Worship” was published in The Guiana Graphic, a newspaper in British Guiana. The first three paragraphs of the article stated: ” The Juma Masjid, or Mosque, the place of worship of Muslims resident in Georgetown and its eastern suburbs, is a work of architectural beauty and eastern charm. Residents in Queenstown, or those citizens who pass Church Street, Queenstown, cannot help but being struck by the magnificent domes of the Juma Masjid standing supremely, yea majestically, lifting one’s thoughts with a sudden jerk to those lands of the East, where minarets abound and shady palms bid welcome to the traveller. The foundation stone of the mosque was laid 52 years ago, in 1895, and the building completed the following year, when it was opened for worship under the late Mr. Gool Mohamed Khan, as the first Imam”. The article later indicated: “… the late Mr. Gool Mohamed Khan, a prominent Muslim Indian merchant, in the year 1895 got together a band of fellow Muslims, and it was decided to erect an edifice worthy of the lofty ideals of Islam”. According to Begum Akhter Jahan Khan’s Publisher Note in the Third Edition of “Unity vs Trinity”, she mentioned that she got most of the information of her grandfather, Gool Mohamed Khan, from two of his daughters, Mrs. R. A. Hakam (nee Husnara Khan), her aunt, and Mrs. G. A. Wahab (nee Gulshanara Khan), her mother. Both Husnara and Gulshanara were born in British Guiana. ” Mrs. Hakam was an active member of the Pakistan Movement and was one of the few Muslim women who worked with Mohamed Ali Jinnah and contributed immensely to the cause of Pakistan. Mrs. Hakam played a pivotal role for the emancipation of Muslim women in India and Pakistan including East Pakistan (now Bangladesh) and dedicated herself for the uplift of their social and moral standards and for the cause of female education. She was the first lady Honorary Magistrate in Calcutta (1927) and an elected Member of the Bengal Legislative Assembly (1946). Briefly, Husanara Khan (Mrs. H. A. Hakam) was born on June 7, 1887 in Georgetown, British Guiana. In 1906 she left British Guiana with her father, Gool Mohamed Khan, who returned to India with his family. She has been cited for many distinguished career achievements. Among her singular accomplishments, she was an elected member of the Bengal Legislative Assembly, she became the first female Muslim magistrate in Bengal, she was the founder of the M. A. O. Girls Scout in Calcutta and the Jamiat Khawateen for women in Pakistan, and she was the only female member of the All India Muslim League Council for Bengal, that was involved in the creation of Pakistan. Mrs. H. A Hakam died October 30, 1985 in Karachi, Pakistan. She was 98 years. Be the first to comment on "Gool Mohamed Khan father of the two British Guiana Begums"